Today we see the UK launch of the iPad. I was lucky in one respect that mine arrived yesterday. I was unlucky in that it arrived five minutes after I had left to go to a MoLeNET meeting in London. My wife phoned me on the train to let me know, she had a hint of glee in her voice. I went for the 64GB WiFI model and didn’t buy the 3G version. This is quite a complex question, you need to consider how and where you will be using the iPad. If using just at home and in the office then the WiFi version will probably suffice. If you travel a lot, on the train, at conferences and events then the WiFi + 3G model may be a better bet. If you are going to be using more than just the iPad out and about, say take your laptop with you too, then you might want to consider a MiFi and just get the WiFi iPad. One of the reasons for getting the 3G model is that it comes with GPS whereas the WiFi model doesn’t. If you are keen on using location services on your iPad, then the GPS is a must. This is probably less of an issue for myself as I do have the iPhone 3GS so that has the GPS capability that I might need. That is probably a key factor on which model to get, is if you have an iPhone or not. So what about size? 16GB, 32GB or 64GB? I initially did consider getting a 16GB model as that should be enough for most activities, or so I thought. One thing that is coming out from the US is that iPad Apps are much bigger than most iPhone Apps and it is expected that they might get “bigger”. You can also watch HD movies on the iPad making use of the bigger screen and they are bigger than your average iPhone movie file. So the next consideration is 32Gb, but my first approach with any storage is think about what I might need and then double it. So 64Gb is probably the idea size for me. I had prepared my computer for the arrival of the iPad, I had downloaded some iPad Apps that I wanted to use, I had updated various iPhone Apps to be universal so that they would work natively on the iPad. After opening the box I connected the new iPad to my Mac and started the initial syncing process. The first thing I did was untick all the automatic syncing, I didn’t want to load everything onto it straight away, and there wouldn’t have been room anyhow. I went through my audio, video, apps, podcasts and photographs deciding what I wanted on the iPad, enough to make it effective, but not too much so that I would be syncing all night! Initial impressions were favourable. It connected easily to my wireless network and was pleased to see I could use the faster 802.11n speeds. I tried a few videos and was impressed with the quality and the experience. HD Videos looked really good and the audio wasn’t bad from the internal speakers. I also tried some iPhone quality video and it was good, but I could notice a “few” artefact issues. I am sure most people would be fine with the video. The “iPod” functionality looked good too, but I don’t think I will be using the iPad as an iPod in any big way – that’s what the iPod is for. The Mail app was also nice, so much easier to view, read and reply to e-mail. This I can see as been my main way of dealing with e-mail on the move. One App I was glad to see was the iBooks App as this was “missing” from the UK iPad webpages when the iPad was announced. Opening the App I was faced with an empty bookshelf, so into the iBooks store to find books. It’s annoying that the iBooks store is on the iPad and not available through the iTunes Store (or of it is I haven’t found it). As a result you have to download the books through the iPad. This did give me one issue. Last night I downloaded the Winnie the Pooh iBook and when I synced this morning, iTunes said that my Mac wasn’t authorised to view the book and deleted it from my iPad. So I had to “buy” the iBook again… now it was a free iBook, but I would have been very annoyed if I had paid £5.99 for a book! It has made me wary about buying books, media and apps ON the iPad. Lots of Apps work well on the iPad, but those that are iPhone only are okay, the x2 works but don’t seem quite right. 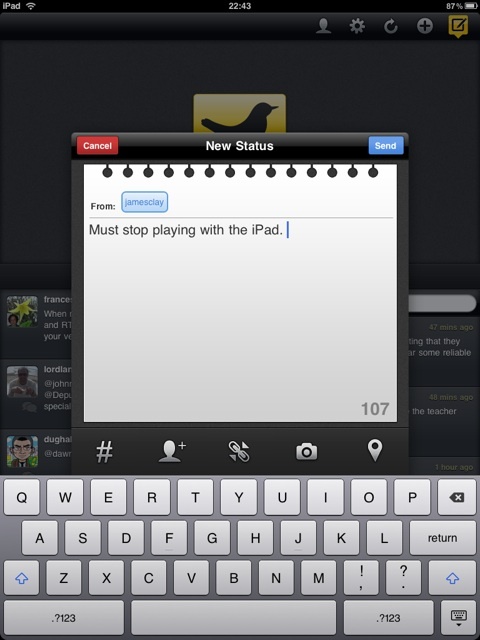 Trying to use Tweetie was interesting but didn’t take advantage of the screen space of the iPad. I have downloaded Tweetdeck and that looks a lot better on the iPad than a scaled up iPhone Twitter App. I had a look, but not a real go on Pages and Keynote, but liked what I saw. There are more things I want to try and look at, but these will need to happen later, and I will follow this blog post up with another one later on. So at this stage what do I think? Well I had high expectations for this device and at this time it is meeting those expectations. It will be interesting to see what I think as time goes by. This entry was posted on Friday, May 28th, 2010 at 11:41 am and is filed under ipad. You can follow any responses to this entry through the RSS 2.0 feed. You can leave a response, or trackback from your own site. Sounds like all good so far. Glad to hear iBooks is available after all. Look forward to reading how your relationship develops. Interesting first thoughts… I’m having a similarly positive initial experience, with the odd frustration chucked in for good measure. However there are sure to be plenty of positive developments over the coming months (OS4, more apps and more HTML5). Re. GPS, isn’t it a fallacy that wifi only versions don’t have “location services”. My 16gb version seems to utilise it just fine! The location awareness that the WiFi iPads have is based on the Skyhook is pretty good for most location based services where accuracy is not really an issue. Twitter locations for example will be just fine on the WiFi iPad. If you are looking at using “location services” for mapping, navigation, geo-data, then the Skyhook system is probably not going to be accurate enough. Okay, gothcha. Cheers for clarification… Neat to have some kind of “location aware” service. Thanks for this James. I have some College money and can’t decide whether to stick to my original plan of buying a new Mac or the iPad as I have good reasons for both, so will be following your reflections carefully. A lot depends on what you are wanting to do on your new “device”. For internet browsing, some word processing and stuff, then I would get the iPad. If however you want to create videos, audio recordings, etc… then get a Mac.